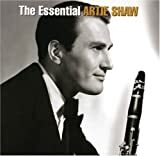 Clarinetist Artie Shaw’s eight marriages (among them glamorous movie stars Lana Turner and Ava Gardner), his irascibility, and his frequent sabbaticals from the music business paint a colorful picture. But he was a serious musician, a gifted writer, and a man who pursued many interests to perfection. The son of Jewish immigrants, he was born Arthur Arshawsky on New York City’s Lower East Side on May 23, 1910. At the age of 14 Art changed his name to Shaw, became a professional musician, and soon switched from alto saxophone, on which he was quite proficient, to clarinet. During his young professional years, Shaw played with prominent dance bands, absorbed black music, discovered contemporary classical music, and became an in-demand studio musician. In 1935 he dropped out and bought a farm. His 1936 performance with a string quartet and rhythm section led to the formation of his orchestra referred to as “swing and strings.” In 1937 he formed a conventional big band which featured black vocalist Billie Holiday whose presence in an all-white band sparked racist outcries. Shaw would continue to angrily confront racism throughout his career. In answer to a demand that he drop black trumpeter Oran “Hot Lips” Page from his 1941 band tour of the south, he cancelled 32 engagements. Shaw’s 1938-39 band (referred to by vocalist Mel Torme as his “favourite band of all time”) brought acclaim from both the public and critics. Their recording of “Begin the Beguine” was sensational and eventually drove Shaw from the music scene, disgusted with being mobbed by fans and their clamors to perform the band’s hits nightly. Shaw, exhausted by the business of music which now included movie-making, walked off the bandstand in November, 1939, and fled to Mexico. During WWII Shaw enlisted and led the Navy band which entertained troops in the war zone. After his discharge he formed his “jazziest” band, featuring trumpeter Roy Eldridge. He then devoted himself to classical music, appearing with a symphony orchestra in 1949. In 1950 he retired to a cattle farm and wrote his autobiography, The Trouble with Cinderella. After performing with a new edition of the Gramercy Five, in 1954 he moved to Spain for five years where he wrote and published fiction. 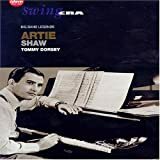 Who Is Artie Shaw...and Why Is He Following Me?